Our reviewers present their Top Ten discs from the past year. Among the artists that show up on multiple lists are Nappy Brown, The Holmes Brothers, Carolina Chocolate Drops, John Németh, Bettye Lavette, and more. All of the lists can be found in our Pick Hit section. 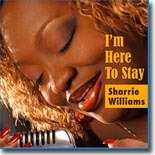 The Surprise pick this month comes from Michigan's Sharrie Williams, who combines blues, soul and gospel into an invigorating mix on I'm Here To Stay. It's our Surprise CD of the month. Previously unreleased recordings from Chicago's Luther Allison finally see the light of day. Underground is this month's Flashback feature. Our What's New section features new releases from Roomful of Blues, Debbie Davies, Celso Salim, Bob Brozman, The Insomniacs, Ernie Hawkins, Eric Bibb, Ellis Hooks, and more. Blues Bytes was the winner of the 2006 "Keeping The Blues Alive" award from the Blues Foundation in the Blues on the Internet category. Thanks to our loyal readers for making this recognition possible! All contents Copyright © 2008, Blue Night Productions. All rights reserved.